Scheduling For Production – Why It Is So Important!! I recently read an article at http://www.dentistryiq.com/articles/2013/06/the-most-common-lies-dentists-tell-themselves.html?sponsored=topic3 discussing the common lies dentists tell themselves. One of these lies that really stick in my craw was about dentists who say that scheduling for production is all about money. Just like the author said in the article, I believe your dental scheduling should be all about scales of efficiency. Many years ago, as a new graduate dentist, I marveled at the tales of dentists who saw thirty-six plus patients in a nine-hour day. A new mouth every fifteen minutes. I always wondered how they did this? To me it made no sense. I always thought, why bring someone back four separate times for four separate fillings? I always thought it would be speedier and more efficient to do four fillings at once in one sitting for that patient. The reasons for doing this are simple. Less time waiting for needles to kick in. More treatment could be done in one longer appointment than in many short appointments. This means that doctor’s time is spent more productively. Longer appointments allow doctors to do more procedures in less time. It is far less stressful on the doctor, on the dental assistant and on the patient. This creates a very relaxed and comfortable environment. Working fewer [in number] longer appointments rather than multiple short appointments also benefits the team. Less steri room time. Longer appointments means fewer instrument and treatment room change overs which means less steri room scrubbing…this is way, way, way, more efficient. Lower number of patient checkouts means that more time can be spent at check out with each departing patient. This results in stronger interpersonal relationships with our valued clients and greater acceptance of us by our clients. And therefore greater customer service!! And that’s not good for business…. So many doctors out there confuse activity with accomplishment. The two are not the same. There are plenty of busy people out there getting no results. Scheduling for production is all about, and I hate to use clichés, it’s all about working smarter. But it is about results. Not activity. And that’s what puts food on your table. And that’s….that’s what it’s all about!! One of the best places in your dental office for building Customer Loyalty is with your Front Office team following completion of the actual dental treatment. This is an area of the Dental Office where Dentists and Owners tend to brush over the importance of the relationships that are built and built upon here. The process of checking out the patient, which we have rebranded as The Ultimate Post Appointment as one of the Five Building Blocks within The Ultimate Patient Experience, is often overlooked in front office protocols and trainings. In truth, the time taken to dismiss the patient following treatment should be allowed to be as long as is needed to create a bond between the patient and the Dental Practice that is so strong that it can never be broken. However, in reality, most dental offices out there are so under staffed in this capacity that the ability to create a seamless post treatment scenario seems just like a pipe dream. The only way to develop the dental check out into a WOW experience for the patient is to have sufficient manpower available so that when that patient is going through the many steps of The Ultimate Post Appointment, there are zero distractions and interruptions. Only then can the processes of the post treatment become so personal, and so pleasant, that the patient considers it an absolute pleasure and delight doing business with your dental office. Consequently, the painful parts of the check out process, like making payment and scheduling next appointments disappear into the ether as mere blimps on the horizon during the pleasantries being discussed by two friends. In previous blog posts, http://tinyurl.com/lwj2jt6 I have discussed that ideally the front office needs to have at least three employees for a one man dental office. A concierge. Someone acting as a client lounge schmoozer. A post treatment coordinator. Someone to schedule ongoing appointments and to also handle the financial arrangements after the patient has seen the dentist. Only then, can the processes of the Ultimate Post Appointment be carried out seamlessly. Picture the reality. Most Dental Offices have one team member trying to perform all three of these roles. They’re trying to make the patient an ongoing appointment, they’re trying to answer incoming phone enquiries, they’re trying to greet the next patient and fill in any paperwork or enter data into the computer….they truly need to be an octopus! And guess what? Because of this lack of staff on the ground, the processes that need to be conducted never get completed in the best possible manner. The patient being checked out gets rushed out. After all, their appointment is over now. The incoming phone call goes through unanswered to a message bank. After all, it’s probably just a shopper wanting a price. The new patient arrives for their appointment, they get a clipboard thrust into their face and a quick “Take a seat” or worse still “Won’t be too long”. Is it any wonder that the public is treating dentistry like a commodity, when most dental offices are giving their clients mixed messages like these as a result of being poorly staffed? What are the dividends to the Dental Office for this investment in extra manpower? A Dental Practice full of patients exhibiting these behaviors makes Dentistry even more of a pleasure to perform. It creates happier dentists, and in turn, happier Dental Offices. And isn’t that a Win-Win-Win for everyone then? The Ultimate Post Appointment is the Fifth Building Block that makes up The Five Building Blocks of The Ultimate Patient Experience, a simple to build system I developed that allowed me to create an extraordinary dental office in an ordinary Sydney suburb. If you’d like to know more, ask me about my free special report. It’s amazing how we can invite unwanted and unnecessary complications in our business with some poor choices of verbiage we may sometimes use carelessly. Years ago, when I refereed Rugby League, it was drummed into me at the beginning of my career that the referee officials that monitored the sidelines were called “touch judges” and not “linesmen”. Linesmen, we were told, were contractors who installed telephone and power cables. Or at worse, were soccer officials. But not in Rugby League. The choice of terminology was all about respect for your position, or your product. The same thing sometimes happens in the dental office. Recently I noticed a well-respected colleague and friend writing about the importance of issuing and giving written quotes. I wrote and told him, that I agreed 100% with the thoughts and sentiments he expressed in the article. I agreed with him that dental fees need to be explained and written down. No discussion. However, I took issue with his use of the word “quote”. I suggested, politely, that the use of the word “quote” was in fact, unacceptable and incongruous in the fine and noble profession of dentistry. You see, plumbers quote. Electricians quote. Smash repairers quote. The act of quoting, and the use of the word “quote” to me implies a flexibility in our fee, and also implies a permission to shop around for other “quotes”. I suggest that the profession uses the words “our fee”, or “your fee”. I’m happy when patients ask for a quote. But I always tell them “Our fee for this crown/extraction/implant will be X dollars.” Full stop. Just let them know your fee. In a recent blog post I made mention that our careless choice of words, though clear to us, could send an incorrect message to our clients customers or patients, because of ambiguity and misunderstanding. We might know exactly what we mean or intend to say. We might think we are saying things precisely as we mean. However, our patients may totally miss the importance of our words, or worse still, our words may take on a meaning we had not intended at all. Your patient, Mrs. Smith arrives at 9:35am for her 10:00am dental hygienist appointment. Your front office team member then proceeds to the back office to let the hygienist and you the doctor, know that Mrs. Smith is here. Unknowingly, and carelessly, she says to the hygienist, who is with a patient, “That’s your ten o’clock and she knows she’s early”. She then proceeds to the doctor’s room where the doctor is treating a patient and announces “Emily’s ten o’clock is here and she knows she’s early”. Now we all know that Mrs. Smith is now here. And we do know she has arrived with plenty of time to spare for her scheduled appointment. Could we have communicated this information better, both in our office and back to Mrs. Smith? I believe, that as it stands, Mrs. Smith has been “scolded” for turning up early. Instead of saying to Mrs. Smith, “You know you’re early” which kind of means “Are you silly? Why are you here early?” why not try something softer and more congratulatory. That way we thank Mrs. Smith and acknowledge her effort in getting in early, and we let her know how much we prefer our patients to be earlier rather than late, for their treatment appointments. What about down in the dental operatories? Now down in the treatment rooms, as we said, both the doctor and hygienist are seeing patients. When the front office person comes in and says “That’s your ten o’clock and she knows she’s early”, or “Emily’s ten o’clock is here and she knows she’s early”, all that does is tell the patient being treated that your office doesn’t like patients turning up earlier than they should for their allotted appointment. Again, how could this be handled best? “Excuse me Dr Moffet. [Pause]. Just to let you know that Mrs. Smith is here for her ten O’clock hygiene visit with Emily, and I’ve thanked her for coming in early”. This conveys all the elements to the Doctor, the dental assistant, and the patient. The patient currently being treated knows there is no urgency, causing the dentist to run away, or speed up or rush his current appointment. The patient in the chair also hears the subliminal message, that they like it here when the patients come early for their appointments. This creates a win-win-win all round!! How’s your language in your dental office? Are you using your best choice of words to maximize communications and eliminate poor subliminal messages? Maximising the correct use of words and language is just one of the many straight forward and easy to implement protocols and procedures that make up The Ultimate Patient Experience, a simple to build system I developed that allowed me to create an extraordinary dental office in an ordinary Sydney suburb. If you’d like to know more, ask me about my free special report. In last week’s blog, http://davidmoffet.me/2013/06/07/how-many-staff-members-do-you-really-need/ we discussed, or entertained the thought, of manning your dental office with as many team members as you really need to allow your day to run as smoothly as possible. Today I’m here to tell you how to make the numbers fit so that you can have the best possible dental office in your town, in your county, in your state!! I suggested in last week’s blog that the ideal number of team members for a one chair one doc dental office was six. Yes six! And I know you all think that’s way too excessive. Well after all, a lot of docs are getting by with just one person performing all roles required. Six staff, working in a comfortable environment, could cost the dental office between say, $240,000.00 and $300,000.00 in annual salary. On average. This is with a healthy mix of age, and experience. 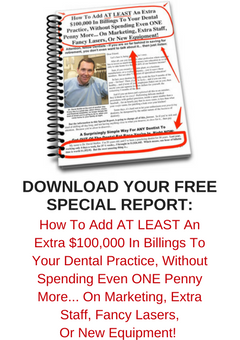 Now we know from my earlier blog postings, http://davidmoffet.me/2013/01/24/dividing-up-the-dental-office-income-part-iii-of-doing-your-numbers/ that wages should amount to twenty percent of the dental office’s gross collections, so expanding on an average of say $270,000.00 a dental office should produce $1,350,000.00 to cover these salaries. Now that’s impossible I hear you say. As you know, for the last eight years, I’ve consistently earned over one million dollars from the exertions of my own hands, working on average about forty weeks per year. And four-day weeks to boot!! Now I didn’t do it out of one room with six team members, but I do believe that *that* is possible when you crunch the numbers. You see 1.35 million is $30,000.00 per week working 45 weeks per year. Divide that by five days and eight hours per day, and you’ve got an hourly production goal of $750.00 per hour. And I say, with six team members, that will be easy! Now let’s look at the benefits. In earlier blogs I suggested that Doctor’s Dental Draw should be 40% of gross collections. So take home pay for the Doc should be $540,000.00 per annum… now that’s nice. Out of that gross collection there’s also company profit of 20%, meaning $270,000.00 to be either reinvested in the business or paid as dividend to the business owners, or a mix of both. And that’s very handy as well. In reality, I think the perfect sized dental office is not far from this model. I’d add a second chair for the doc, to minimize lost time during tear down and set up. A good hour per day can be saved by having the next patient seated and ready to go in the adjoining treatment room. Saving an hour per day increases productivity by $750.00 per day, $3750.00 per week or a staggering $168,750.00 per 45-week year!! That’s surely enough to justify the second chair. I’d also add a third chair for hygiene, which would be a pure profit centre. Unassisted hygiene should return two thirds of collections to the business as profit and one third will cover the hygienist’s salary. The two thirds is pure profit for the business. The two extra chairs and hygienist would require no extra addition to the six team members already proposed in the ideal model. Do you think this model is workable? I certainly do. I know, because I’ve done it. And you can do it too. I can teach you.